Ultradragon might have talked their way into a tag team title match with Black and Blue, but are they ready? More importantly, are they ready for the Catgirls when they face them next chapter? 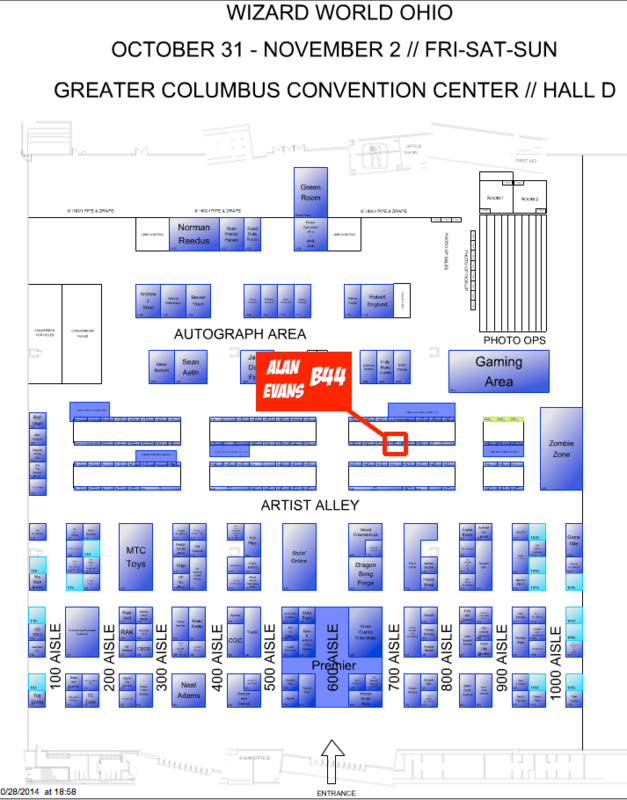 This weekend I’ll be at Wizard World Ohio in Columbus, in Artist Alley, at table B44! One of my favorite shows of the year. I have some terrific neighbors in Lora Innes, Trevor Mueller and Thom Zahler! Please stop by if you’ll be there and check below to where I’ll be seated. 12:30 – 1:15PM COMICS ASSEMBLED PRESENTS: SMALL PUBLISHERS, BIG BOOKS! (C121)? Join panelist/host Thom Zahler (Love and Capes, My Little Pony) along with Lora Innes (The Dreamer), Alan Evans (Rival Angels) and Trevor Mueller (Albert the Alien) as they discuss the challenges and rewards of being a small/self publisher. In case you missed it, check out the FAWN/Rival Angels commission I posted on Monday with Elizabeth Cromwell and Snow Kitten! Brand new chapter! Vote to see what’s coming up in Chapter 14! Hey, Sun and Sabrina have been in worse scrapes than this. Will a bit of training, they’ll be ready. So what I’m thinking is that they are thinking they need to put on a show for Black & Blue and expose all types of weakness and get steam rolled. Then when they fight Black & Blue they catch them off guard when their weakness turn out to be fake outs. And this is where Krystin mentions the part about how Sun’s ex liked to see her losing. The cat girls, being catty, blurt it out on live TV, causing Sun to think the only other person who knew, Sabrina, opened her big mouth. Well everyone knows that wrestlers never hear the juicy details that are put on TV. I think it is known as TV blindness, worse the wrestler seldom know that there is a camera man filming them. I’m thinking this bad blood match is going to get verrrry interesting! Next week is going to be FUN. I get the feeling that the Catgirls are not happy that some “rookie” team just jumped them in the queue and got a title shot. This might be some serious payback and a teaching moment for UltraDragon. Bad Blood might become the Crowning of Damage Inc. All that is truly needed is for Nikki to get into the TV Title match. So far I´m not impressed by Black & Blue. Their victory over Victoria & Xtina wasn´t convincing. My favorite panels of this page are panel 4 & 5: the look of The Snow Kitten & especially Rose. Panel 5 Krystin :). VI: Brooke is very determined to build a winning streak. I expect her to pull it off. Congrats on speaking on a panel at Wizard World! That’s really cool. I don’t live close enough to that show (or any Wizard World show, alas!) to attend, but it looks like a fun show. Hope you did well!